If the answer is no, then this decision will be easy for your doctor to make, as following the timing of your natural cycle is not an option. If you do ovulate naturally, then know that a natural cycle could be an option for you. Are Predictability And Minimizing Monitoring Time Paramount For You? We all love predictability, but if that’s a big priority for you, then understand that artificial cycles allow your doctor to set the timing of your embryo transfer with much greater precision than would be possible in a natural cycle. Natural cycles are timed based on when your body experiences an LH surge, and that’s not always easy to predict. Furthermore, if you ovulate early or there’s an issue in detecting your ovulation accurately, the cycle will be canceled and you’ll have to wait until the next month to attempt a transfer. Natural cycles, particularly the true natural without hCG trigger, are likely to require more monitoring appointments -- your doctor may want to monitor your LH using blood tests (because at-home ovulation kits can be inaccurate and hard to interpret), and you’ll likely need more ultrasounds to follow follicle development. If you’re traveling far from home for treatment and need more predictability on date of transfer itself, then natural cycles could present difficulties. Despite the extra monitoring, and the unpredictability, natural cycles are often seen as more patient friendly, because artificial cycles require a significant course of hormones. And, if GnRH is added, those medications can be expensive. Artificial cycles require estrogen, then progesterone injections, over a longer period -- often four to twelve weeks. At this point, you will have most likely taken your fair share of hormones during a retrieval cycle. Knowing that most women will require more than one transfer for a successful pregnancy to take place, you might want to avoid more months of hormone injections and the attendant side effects. If that’s the case, a natural cycle could be very appealing. In the case of a true natural cycle, you could go completely hormone free, and even with a supplemented natural cycle, there is only one hCG shot, and then often vaginal progesterone supplementation (as opposed to the long courses of intramuscular progesterone injections). How Comfortable Are You With Another Doctor Doing Your Transfer? One big tradeoff when choosing a natural cycle is that, because your individual cycle is less predictable than the more one-size-fits-all hormone preparations, your doctor might not be able to accommodate you in her schedule to personally perform your transfer. You’ll need to evaluate how comfortable you would be with other doctors from the clinic performing your transfer because, especially at larger clinics, a natural cycle gives you slimmer chances of getting your own doctor on transfer day. What’s Your Clinic’s Default? Do They Change Courses After Failures? Some clinics don’t use natural cycles at all, and it could be good for you to know that up front if natural sounds like something you could be a candidate for. There are many reasons a clinic might avoid natural cycles. The first is a reasonable one -- it’s harder for them to organize staffing in the embryology lab and for transfers if the date that embryos must be thawed and transferred isn’t predictable. The second reason is that some doctors have just always used artificial cycles, and it’s so ingrained in their practice that they don’t try it another way. Asking your clinic if they’ll switch cycle types if you’ve failed transfers could be a good move. Just because the overall data doesn’t show a benefit of one type of cycle doesn’t mean that your body wouldn’t respond differently. Artificial cycles are generally a one-size-fits-all concept, and if your endometrium is receptive at a different time than would be expected following estrogen and progesterone. So if you’ve failed a few artificial transfers, you very well may want the option to do your next transfer with fewer or no medications. That said, if your clinic has very little experience doing natural cycles, there could be a higher chance that something could get missed (there’s a lot of monitoring that some doctors and clinics aren’t accustomed to staying on top of), in which case you could be moving your transfer attempt to the following month. 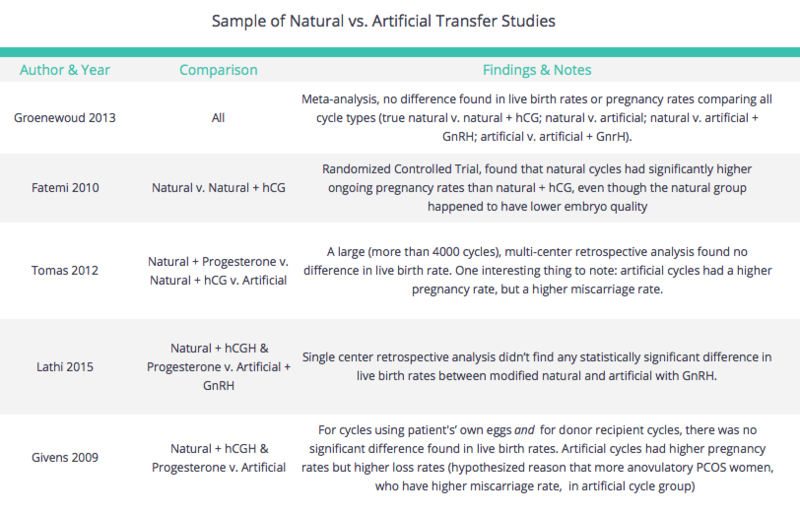 Ask early on what your clinic’s approach to frozen embryo transfer preparation is -- some do predominantly natural cycles, but the norm is still artificial.